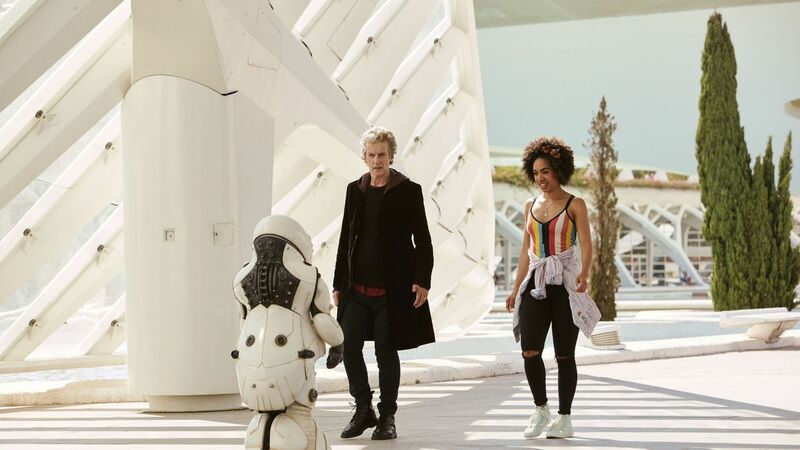 Each Doctor gets a monster which perfectly suits their greatest weaknesses and for Peter Capaldi's incarnation, what could be more dangerous than robots who kill you for not smiling. And while his Doctor has cast off the moodiness he had early on, he isn't the naturally grinning maniac that his previous three incarnations where. This makes for a lot of fun when the Doctor and Bill have to try and fool the Vardi, but beyond that, there isn't a lot to say in favour of this episode's villains, they are a textbook setup for an episode with an intriguing set up that losses a lot of its luster when all is quickly explained. That isn't something which is unusual for Doctor Who, the explanations often rely on technobabble and other assorted gibberish. But this episode's tepid conclusion doesn't overshadow the half-hour of the Doctor and Bill exploring the futuristic city and getting to know each other and the world they find themselves in. Experimental storytelling on this show - especially during Peter Capaldi's time - isn't anything new. The structure of Smile is very similar to The Girl of Lived, which puts a similar focus on the main core of characters - but this episode is one of the best stories to have trust in its two main characters to carry the main bulk of the story. 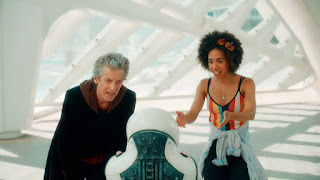 To their credit, Capaldi and Pearl Mackie are really up to the challenge and credit needs to be given to the author, Frank Cottrell-Boyce, who manages to acquit himself a lot better here than he did with In The Forest of the Night. The opening scene sets the tone quite nicely for the rest of the episode with Bill embracing the magic of the TARDIS while wondering about the practicalities of it all. And she is right, what is the point of having seats so far away from the console? And there is a really intriguing edge to their banter about stealing the TARDIS, with the Doctor responding to Bill's question about if she would know how to fly it and he tells her that he didn't when he started out. And he didn't, in some of the earliest William Hartnell tales, we saw him struggling with his machine. 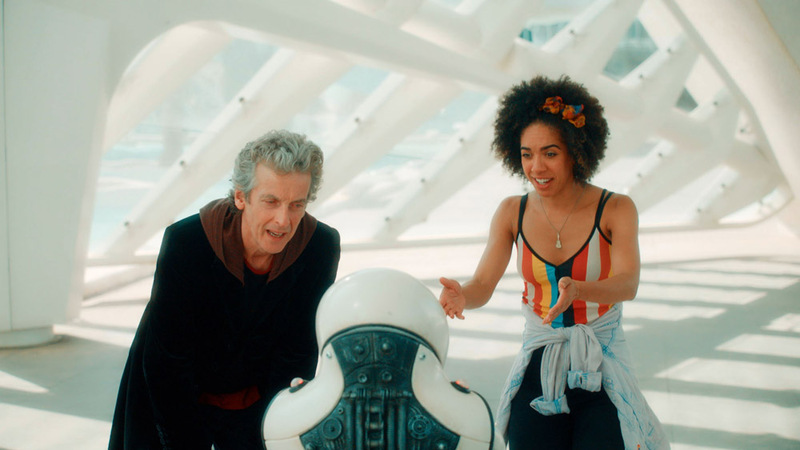 While none of this feels like it is foreshadowing the rest of the story, it does help set the dynamic between the Doctor and Bill apart from his previous incarnations and companions. It was a delight to see Bill expressing such a look of wonder at the future. Much like when she resisted the mind wipe in The Pilot, she shows some more good knowledge of science fiction with what she believes to be the perfect robot. She approves of the future algae but disapproves of the apparent food sexism with the Doctor being served two portions while she is only offered the one, with the Doctor's wider perspective complicating matters slightly further. And the episode hits an intelligent balance here, sketching Bill as an intelligent character while never forgetting that sticking someone in the Doctor's universe is bound to change ones perspective. Bill also shows a more perceptive side here, even if it does take her a little longer to realise there was no need to stare at a map for so long. Perhaps correctly, Smile decides to downplay Bill's curiosity over whether the future will be a happy one or not. Instead, this feeds into how excited she is too explore the future city but never circles back to it when it reveals the dark secret of the city. But one can look past this as Bill's characterisation is still forming, but the story might have been a lot stronger if it had circled back to Bill's initial hope for a happier tomorrow. But it is important to remember that it is still early days for her. Already though, she feels more drawn than Clara did for a worrying length of time she was a companion and perhaps this is because Bill is here to be a character - not a mystery. Since the show came back in 2005, the second episode as been a chance to show the dynamics between the Doctor and his new companion and the show finding its bearing for a particular series, so if Smile were to be judged for its main characters and how they push the plot forward, this one would be a sure classic. This episode follows in the footsteps of previous series with the second episode being a chance to show a companion a little of the future, like The End of the World, New Earth, Gridlock, Planet of the Ood, The Beast Below and Into the Dalek. Planet of the Ood is a great look at the jaded future for humanity and this isn't a bad thing for an episode to use when establishing the new iteration of main characters. But it can only excuse the flimsiness of this episode so much. The trouble with this story, like the Magic Haddock, the Doctor keeps mentioning, is that the Vardi aren't meant to be either good or evil. They are just different in their thinking from humans. But saying they think differently isn't a good explanation for something which can't speak for itself and without some of the needed underlying logic, it is hard to look at this episode on a deeper level. The only possible explanation I can think of to explain the Vardi's actions is that they see humanity as one entity also, killing a human being is to them much like deleting a corrupted file on a computer hard-drive, without any understanding that in deleting the corrupted file, it allows the virus of sadness to spread. But perhaps this is where the strength of Smile, the two handed structure allows the Doctor and Bill to dominate the entire show becomes is ultimate weakness. During the final moments of the episode, the Doctor appears to indicating humanity for its treatment of the Vardi, calling them a slave race and says they are the going to be the de facto race of the planet because they don't have any power in the situation. That is something which reads like the kind of totalitarian setups that the Doctor is always happy to take down. But he does take it upon himself to speak on behalf of the Vardi, however, if we knew more about the backgrounds behind the Vardi and the Humans than we learnt in the last ten minutes of the episode, perhaps his stance would make a lot more sense but for a resolution, this feels totally rushed.